How have Vancouverites handled the lack of ride-hailing? Their city has hardly ground to a halt. The percentage of Vancouverites who commute to work by walking, cycling, or transit rose from 57% in 2013 to 59% in 2017. During that time, the share of commute trips by bicycle jumped by 50% as Vancouver rolled out investments like a network of protected downtown bike lanes. TransLink, the regional transit authority, grew ridership by 5.7% in 2017, the fastest rate in North America. Ridership rose even faster in 2018. If you live in just about any North American city, you can whip out your smartphone and hail a ride whenever you want. In San Francisco, ride-hailing has been available since Uber launched in 2010, and breakneck expansion over the next five years brought the company and its competitors to cities as small as Easton, Pennsylvania. Places like Austin, Texas, might have temporarily booted Uber and Lyft over concerns with their business practices, but today you can use their services pretty much anywhere in the United States or Canada. Unless, that is, you find yourself in Vancouver, British Columbia. Unlike every other major North American metro area, the Vancouver region doesn’t allow ride-hailing. That makes Vancouver a unique example of what happens when a thriving North American city politely—this is Canada—passes on the ride-hail bandwagon. The result: Vancouver’s public transit system is adding riders even as usage drops in many other cities. Bike commuting is growing, and car-share services like Car2Go are booming. With a growing regional population of 2.5 million and a reputation for attracting outdoorsy millennials, the Vancouver metro area seems like a region well-suited for ride-share services. After all, Seattle—just a three-hour drive to the south—saw 20 million ride-hail trips in 2017. But British Columbia’s laws classify ride-hail as limousine services, which are subject to a minimum charge of CA$75, and local insurance regulations don’t yet enable coverage in unique ride-hail situations, such as if a crash happens before a driver picks up a rider. Today, services like Uber and Lyft aren’t available anywhere in the province. That likely won’t remain the status quo for long: More and more Vancouverites are clamoring for the region to let ride-sharing in. It’s likely they’ll get their way by the end of the year. For now, however, Vancouver offers something of a natural experiment in what happens to a city’s transportation options in the absence of Lyft and Uber. So how have Vancouverites handled the lack of ride-hailing? Well, their city has hardly ground to a halt. The percentage of Vancouverites who commute to work by walking, cycling, or transit rose from 57 percent in 2013 to 59 percent in 2017. During that time, the share of commute trips by bicycle jumped by about 50 percent as Vancouver rolled out investments like a network of protected downtown bike lanes. TransLink, the regional transit authority, grew ridership by 5.7 percent in 2017, easily the fastest rate in North America. Andrew McCurran, TransLink’s director of strategic planning and policy, says ridership rose even faster in 2018, by 6.7 percent. 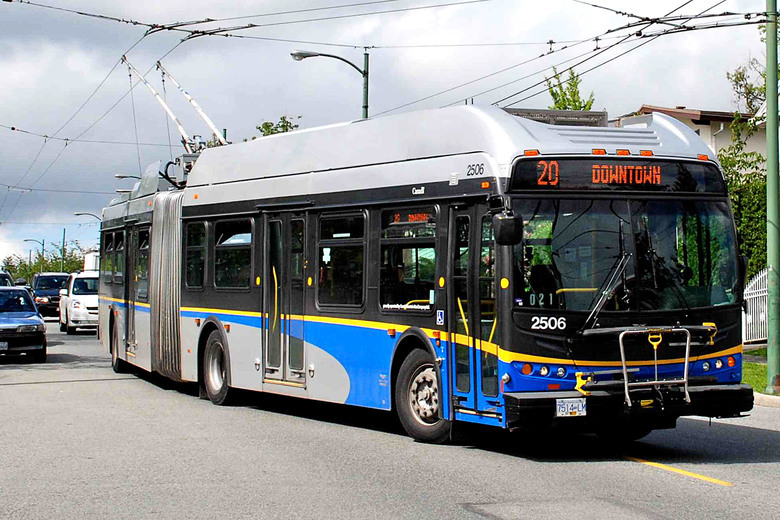 Remarkably, a major driver was TransLink’s bus ridership, which rose by 7.3 percent last year. The overall TransLink network of buses, trains, and ferries is impressive: 90 percent of Vancouverites live within a 10-minute walk or bike ride to a high-frequency station. (Only New York City has a higher share in North America.) Transit payments are a cinch, as residents can access the full network with a NFC-enabled smartphone, a credit card with a smart chip, or the TransLink Compass Card, which comes as a bracelet and a physical card. TransLink’s robust growth stands in stark contrast with its American peers; 31 of the 35 largest transit systems in the United States lost riders in 2017 and bus ridership in the United States dropped by 5 percent. Vancouver’s lack of ride-hailing may have helped drive its strong numbers; a much-cited University of California–Davis study in 2017 found that roughly half of ride-hail trips in seven major American cities took the place of transit, walking, or biking (or wouldn’t have happened at all). someone doesn’t want to drive round trip. With transit, car-share, and bicycling numbers so strong without ride-hailing, it would be understandable if Vancouverites wanted to leave the current policies intact. After all, the experiences of other cities suggest ride-hailing could compete with transit for riders, worsen downtown congestion, and lead to drivers dangerously entering dedicated transit and bike lanes. But that hasn’t happened. TransLink’s McCurran says that the majority of local residents want Uber, Lyft, and the like to be legalized. FOMO may be playing a role; McCurran notes that many Vancouverites have tried ride-hailing elsewhere and don’t understand why they can’t use it at home. Members of the tourism industry have been forceful advocates, with one calling ride-hailing’s absence “unfathomable” and bemoaning the “tourists [who] get frustrated with being unable to get around where they need to go.” The ride-hail companies have joined the debate too: In January Lyft devoted a blog post to explaining how its service could improve late-night mobility options for Vancouverites. To be fair, online complaints about local taxi service are numerous, with one Reddit contributor complaining that “trying to get a taxi in Vancouver when there are sports/concerts/etc is damn near impossible.” As has been in the case in cities worldwide, the local taxi industry has been driving opposition to ride-hailing’s entry. Regardless, Vancouver’s days as a mobility anomaly appear numbered. In 2017, British Columbians elected a new government led by the New Democratic Party, which promised to legalize ride-hailing. TransLink is preparing for ride-hailing’s expected arrival this year, though it’s still unclear whether and when that will happen, or how it will be implemented. Policymakers have recently explored a cap on ride-hail vehicles of the sort New York City adopted last year—though that could lead to the counterproductive result of concentrating ride-hail vehicles in dense areas that are already well-served by TransLink like downtown Vancouver instead of suburbs like Maple Ridge that have less transit access. McCurran says TransLink is “cautiously optimistic” that ride-hailing will ultimately improve the region’s mobility network. “If handled well, with congestion-management measures, ride-hail can be a part of a service mix that collectively makes travel without a private automobile more competitive,” he says. McCurran declined to elaborate about what such “congestion management” might entail, but road pricing could be an option. Last month the city of Vancouver proposed “per-trip mobility fees,” a tax on future ride-hail trips taken at peak travel times that is designed to keep traffic flowing. In the meantime, TransLink is preparing for ride-hailing by testing the conversion of a few parking spots into future ride-hail pickup and drop-off points, with the goals of reducing congestion and improving pedestrian safety (an approach that is being tried in cities like D.C.).